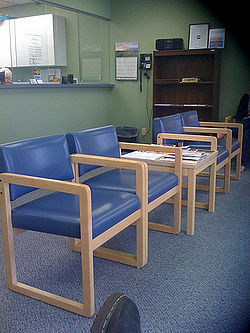 A waiting room at a Planned Parenthood facility. Planned Parenthood is a contraceptive provider and abortion referral organization with influence in the United States and the world. Planned Parenthood is funded in part by private donations and funding from the federal government. Planned Parenthood was established by Margaret Sanger, a eugenist who advocated the ideas of superiority of whites. Planned Parenthood, since the Roe v. Wade court decision, has grown significantly and become the primary organization in the United States of its kind. Planned Parenthood is a pro-choice organization, thus it denies the sanctity of life and human beings, and is therefore a humanist work. There is compelling evidence to believe that Planned Parenthood has a special intention to rid the United States of African-Americans. In communities with a significant black population, there seems to be a Planned Parenthood 'clinic'. Sanger also once stated, "Colored people are like human weeds and are about to be exterminated." These comments reflect animosity towards minorities as in the case of Americans of African descent. Planned Parenthood’s Self-Destructive Behavior New York Times, June 23, 2012. This page was last modified on 26 January 2014, at 23:13.